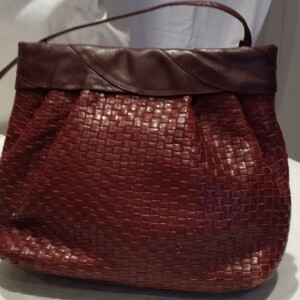 Lovely petite shoulder bag by the designer Etienne Aigner in woven leather with a zip fastener. The colour is burgundy at the top of the bag and the woven section is of a lighter burgundy. Although used this little bag is in excellent condition and measures 10 inches (26 cms) wide 7.1/2 inches (19 cms) high and 2.3/4 inches (7 cms) deep. The lining has the Etienne Aigner logo printed on it but unfortunately the lining has ink stains as shown in the picture of the lining and is priced accordingly.